Travelers jaunting through Indonesia don't need to leave their iPhones behind; the country is surprisingly well-connected to a wide-ranging GSM network. You can even pick up cellphone signals in surprisingly out-of-the-way places like Banten Lama and the Komodo National Park; your Facebook friends and Instagram followers will be able to keep up with your adventures as you go. Buying a local SIM card is a far better option than roaming in the network using your own phone plan. The latter can be ruinously expensive; the former is highly convenient and surprisingly cheap. For more details on using a prepaid SIM in the region, read this article on Cellphone Roaming in Southeast Asia. If the GSM standard is something you're not familiar with, read this: How to Stay Connected While You Travel Overseas. There are over a dozen local GSM providers in Indonesia, but Telkomsel strikes the ideal balance between low cost, good connection and widespread network. You guide has consistently used Telkomsel's prepaid SIM-card - the SIMpati; the card performs admirably around tourist destinations like Bali and Yogyakarta. Where to buy. You can buy a prepaid card immediately upon entering the country; kiosks at the arrival area of most Indonesian airports sell most brands of GSM prepaid cards. You can even buy SIM cards or additional call credits from small warung (streetside eateries) and convenience stores. The SIM card comes (naturally) in a thick plastic card wrapped in a paper envelope; the SIM card can be detached from the rest of the card for use in your phone. SIM cards are scored so the chip can fit into any compatible cellphone, down to the micro-SIM slots on late-model iPhones. Loading prepaid credits. When you buy a Telkomsel SIMpati prepaid SIM, buy additional call credits as well, which comes in a separate scratch-card. The more surfing you intend to do while in Indonesia, the more call credits you should plan to buy. Instructions for reloading call credits are sadly, only in Bahasa Indonesia. You can ask the SIM card seller to load the call credits for you. Once the call credits are loaded, you can use the phone to call and text to your heart's content. You can even call abroad; dial 01017 plus the overseas number to avail of a reduced rate (calling the U.S. costs IDR 360, or about 3 US cents a minute). Surfing on the Internet with SIMpati. Even with the additional credits loaded in, your connection isn't quite ready to surf yet. You need to buy "flash", or blocks of usable data per megabyte, which will be deducted from your prepaid balance. Using your existing credits as a balance, you can purchase “flash” by dialing *363# and sending as a service command on your GSM phone. This takes you through a menu that allows you to select the size of the “flash” you want to purchase; 5 gigabytes is plenty for two weeks' travel! Rates can change without warning, and may vary even from location to location (they tend to be cheaper in Sumatra, Java and Bali, then progressively more expensive as you move east to Indonesia's outlying territories). For up-to-date information on tariffs, visit Telkomsel's official site. To check on how much prepaid credit you have left, Telkomsel provides two different numbers: one for call credits, the other for Internet (or "flash") credits. Call credits: dial *888# and send as a service command on your GSM phone. This enables a pop-up window that shows you how much you've got left, in Indonesian rupiah. To replenish your call credits, you have to buy cards at your nearest convenience store and top up by following the instructions; you can also ask the seller to load in the additional credits for you. Internet credits: dial *889# and send as a service command on your GSM phone. This enables a pop-up window that shows you how many MB you've got left to use. To replenish this, see "Step 2" under the previous heading, "Surfing on the Internet with SIMpati". Cheap international calls, strong phone and text coverage, and cheap and relatively swift Internet browsing make Telkomsel a prime choice for travelers in Bali and the rest of Indonesia. 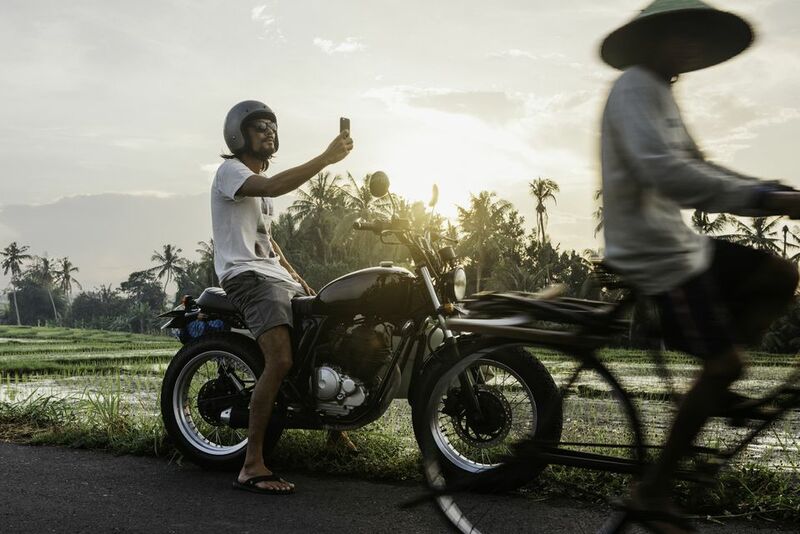 Telkomsel is pretty well-established in Indonesia; in Bali, your guide could get a connection pretty much everywhere, with only occasional dead spots in remote areas or the open seas (those selfies of you climbing Anak Krakatau will have to wait till you get back to your hotel room). Your guide has not covered the width of Indonesia with a Telkomsel-equipped smartphone, though, so results may vary. Transportation in Indonesia: Plane, Train, Bus or Ferry?